Posted by Carolyn Burns Bass in coming-of-age, fiction, literary fiction, weekly topics, YA fiction. Novels, like the characters who fill them and the authors who write them, have a backstory. They may be conceived in a spark of insight or a foggy vision of crisis, they may take years to write or dashed off in a flurry of days. Some are methodically plotted with outlines and color-coded spreadsheets of character traits and story arc, while others are mined in a word-by-word chipping away to the mother lode of storyline. One of the most common questions #litchat followers ask of guest hosts is how they got their book published. The week of October 4-8 in #litchat we’re talking about just that. We are pleased to have Susan Henderson as guest host on Friday, October 8. 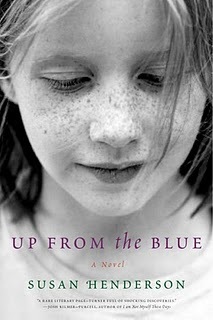 Susan’s first novel, Up from the Blue, launched last week amid a buzz of media attention generated not only from its brilliant storytelling, but from the years it took to bring this powerful novel to market. Told in the wizened voice of seven-year-old Tillie Harris, Up from the Blue, traces a year in the life of a family torn apart by debilitating mental illness and obsessive professional pride. Tillie Harris adores her tortured mother, striving to become the girl she believes will draw her mother back into the fold of family life. Tillie’s father wanders in and out of the story giving orders like the Air Force colonel he is, hiding his own brokenness by managing a household to appear beyond reproach. From the bowels of the house to the bedroom where Tillie lies awake until she’s able to enter her secret world, to the decrepit cement hole in the backyard that once was a swimming pool, the destructive forces of pride, obsession and depression zero in on the Harris family as accurately as the missiles Colonel Harris designs at the Pentagon. Up from the Blue first sold first to St. Martins in 2006, but differences in vision between the editor and author led Susan to do the unthinkable of a debut novelist. She bought back her novel. Susan has blogged about her experiences birthing Up from the Blue in her popular website, LitPark, as well as in a column, Evolution of the Book, published at The Nervous Breakdown (TNB). 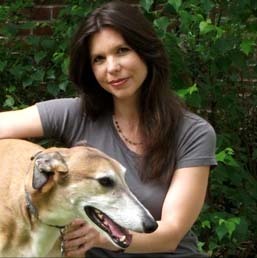 Susan is the founder of LitPark, and blogs occasionally at Huffington Post, as well as Brad Listi’s The Nervous Breakdown. She is the recipient of an Academy of American Poets award and grants from The Ludwig Vogelstein Foundation and The Lojo Foundation. Her work has—twice—been nominated for a Pushcart Prize. Her work has been published in a who’s who of literary journals through the years. She and her husband live in the northeast with their two boys. Follow Susan Henderson on Twitter at @LitPark.